Last week I got a call from my neighbor, Betty, about crabapples being ripe at another friends' home. (Everyone should have a neighbor like Betty. 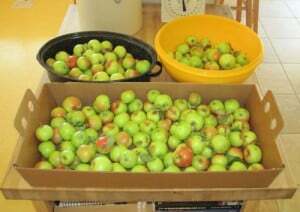 🙂 Never one to let produce go to waste, I warned the boys that we were going to go pick crabapples. 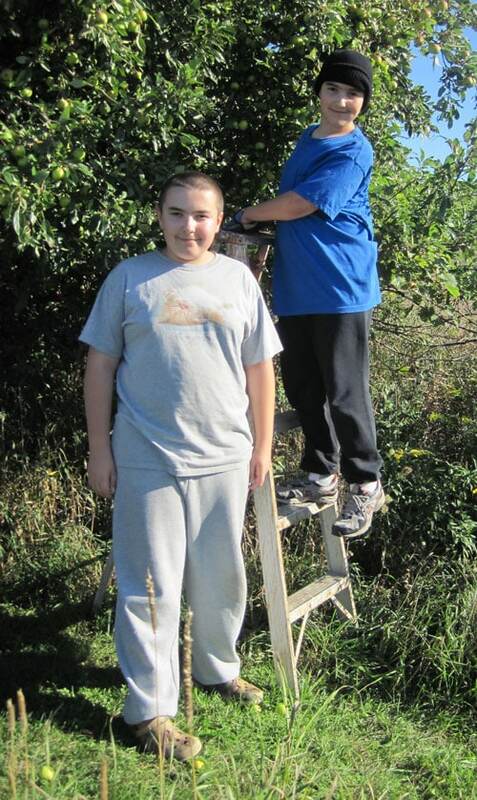 My eldest, wanting to get done sooner, headed out to the wild trees at the border of out field. These are normally so bug infested as to be inedible, but this year one had a bumper crop, and we were able to pick quite a few that were in nice shape. I went picking over at the neighbor's, too. 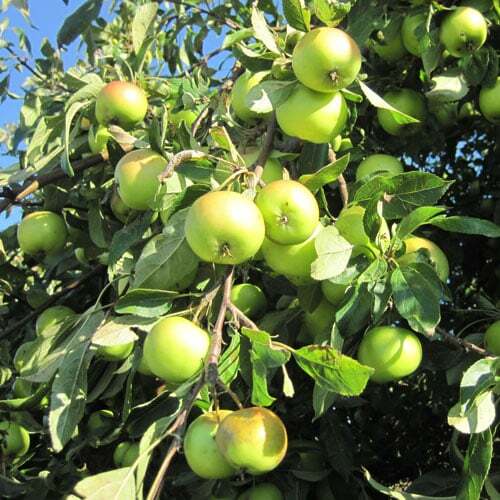 Our apples were smaller, firmer and greener. Theirs were larger, softer and dead ripe. Just a bit past prime for canning whole, as they softened up and fell apart a bit during processing, but they were still delicious. I canned the apples whole two ways – as honey cinnamon apples and spiced apples. Because the neighbor's apples had been sprayed (not a lot, I was told, but still sprayed), I washed them first in water with a squirt of my non-toxic dish detergent, then rinsed them in water with white vinegar in it, them rinsed again with clean water (and took the water out after to water the flowers). I worked from right to left, soap wash, vinegar rinse, clean rinse and into the dish drainer. 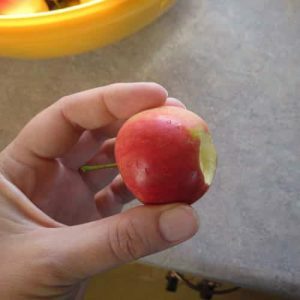 Cut out the blossom end of the apple, but leave the stem intact. You don't need to core the apple. Both of these recipes could be made with sliced apples, too, if you don't have crabapples available. After removing the blossom end, poke the apple with a fork five times to allow even penetration of syrup. Note: You want to prep all your canning equipment and syrup before you start cutting out the blossom ends, so you can get the apples in the syrup right away to minimize browning. This recipe was inspired by the book Putting it up with Honey, where they feature instructions for apple slices canned with honey. 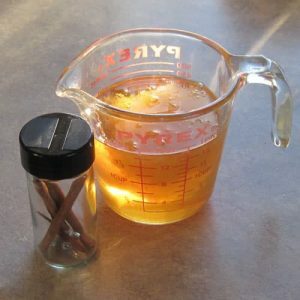 Prepare syrup by adding honey to water and heating until the honey is dissolved (this is a nice way to use crystallized honey straight from the jar). Add cinnamon sticks, simmer five minutes. Add apples (with blossom ends removed) to syrup. Simmer five minutes (just to heat through), you don't want to overcook them, as they will cook more during processing. Apple skins will darken as they cook (think applesauce or baked apples). 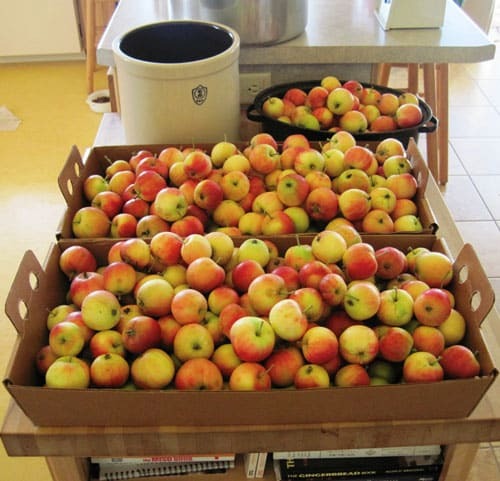 Load hot apples into hot quart jars, fill with syrup to 1/2 inch headspace. 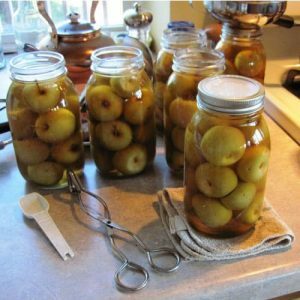 Run you chopstick or small non-metallic spatula between the apples and the jar to remove air bubbles (metal may scratch the inside of the jar). Add extra syrup if needed. Wipe rim clean, screw on lid (not too tight – air must escape during processing). * Note: if using Tattler lids, use 1 inch headspace, tighten rings, then unscrew 1/4 inch. When the cooking time is up, remove jars at once and place on a rack or on towels away from heat and away from any draft. If using Tattler lids, tighten rings as soon as they are removed from the water bath. This is not necessary for standard canning lids. After 12-24 hours, check lids for seal. Standard lids should be concave in the center and held down tightly. Tattler lids should be snug if you try to pull them off. I love listening to the “ping” as the jars seal. This recipe is from my neighbor, Betty, who has been making it for years. Prepare syrup by mixing all ingredients except apples and heating until the sugar is dissolved. Boil one minute. Add apples (with blossom ends removed) to syrup. Simmer five minutes (just to heat through), you don't want to overcook them, as they will cook more during processing. 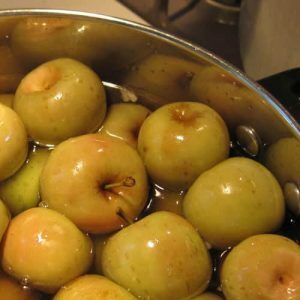 Apple skins will darken as they cook (think applesauce or baked apples). After 12-24 hours, check lids for seal. Standard lids should be concave in the center and held down tightly. Tattler lids should be snug if you try to pull them off. I ended up using our home apples for the spiced apples and Betty's apples for the honey cinnamon apples. Our home apples were smaller, so more of them fit into a jar. I noticed that while the honey cinnamon apples were processing, they became quite soft (some of them fell apart a bit), so I decided to process the balance of the very ripe apples into apple sauce and fruit leather. Employ child labor (if available) to turn crank on food strainer (my son loves turning the crank). 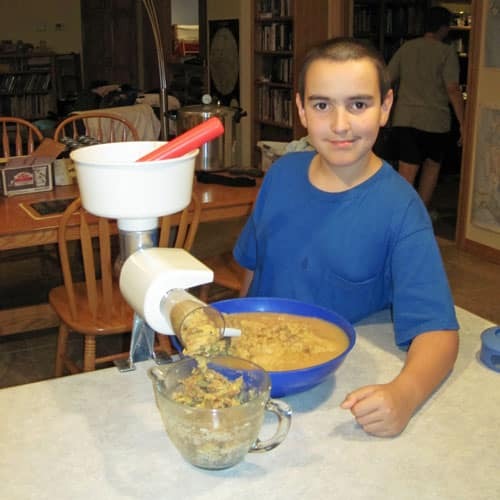 Load the apples, turn the crank and you have applesauce. 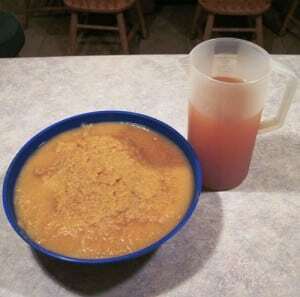 We ended up with a big bowl of applesauce and nearly two quarts of juice. If you don't have a food strainer, you can peel and core apples and cook until soft, and them puree with a potato masher. This will give a chunkier sauce. A food mill or chinois will also work, but I really like my food strainer. Add a pinch of salt and a bit of maple syrup if you like (my apples were really sweet and tasty, so I skipped this). That's my first experience with crabapples. So far, so good. The honey cinnamon apples are sweet with just a hint of spice. I haven't sampled the spiced apples yet, but they smelled good. To eat the apples, you just nibble them off the stem and core. Thanks for stopping by, and I hope you enjoyed the post. I love that you can put them in the jars with skins and stems! What a time saver. Between your post and the cooler weather I think I'm ready for a fall dinner! The apples in the jar look so cute. I have never canned apples like that. Thanks for sharing. Thanks for stopping by, Abby. 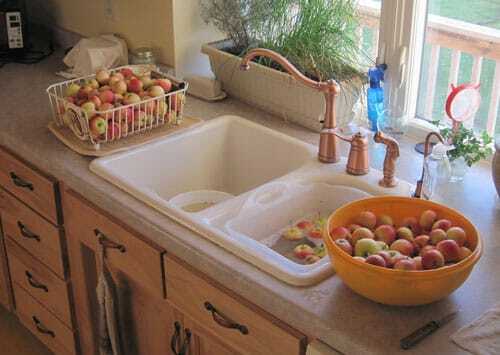 Remember, these are crabapples – you'd need awfully big jars for regular apples, and a BIG canner, too. 🙂 You can use the syrups with regular apple slices, though, if you don't have crabapples. THANKS….been trying to think of something to take advantage of the jillions of crab apples that grow around town each year. Usually I make jelly but I found this and thought I would give it a try. They smell wonderful and look beautiful in the jars. I cannot wait for them to cool enough so that we can taste!! You mentioned yellow transparents…can you can them this way as well? Mine are done for the year but I was wondering for year after next. I usually just freeze slices and can apple sauce with them. I’m planning to use the yellow transparents for sauce. Since they are a more mealy apple, I don’t think they’d hold up well for this sort of canning. Sauce on the stovetop and pie in the oven as I am typing this. 🙂 Running a little late, but the house smells great. Am I understanding correctly that you cored the crab apples but and canned them with the skins still on? Weren’t the apple skins tough and chewy once cooked? Or did you just peel the apple once you had them on your dinner plates? They don’t get cored, only the blossoms are cut out. The skins are essentially cooked during the canning process, and become quite tender. You nibble around the seeds and stem. 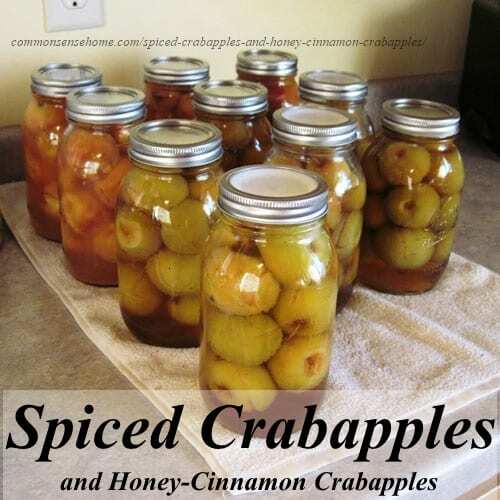 My husband suggested that we should make spiced crab apples with our crab apples we picked. I will be trying your Honey Cinnamon Crab Apples. I expect them to taste great and that my family will enjoy them this winter. Thanks for posting. I hope they like them! If I use the honey cinnamon recipe for “regular apples” about how many pounds of apples will I need? Can I quarter the apples instead of using “rings”?? Given that there’s a huge variation in apple sizes, it’s nearly impossible to say exactly how many apples will fit in a jar. Yes, you could quarter them instead of slicing them, but slicing will probably allow more fruit to fit per jar. PickYourOwn.org says it takes roughly 3 pounds of apples to make one quart jar of applesauce, so you know you’ll likely to be able to fit less than three pounds if you’re slicing apples in some way. I have an odd question. I made both of these. (And holy cow, are they AWESOME!!). I just opened our second jar of the honey cinnamon apples, and they’re FIZZY! And bi fizzy, I mean carbonated! You bite into the apples and it’s like that first bubbly sip of soda. They’re not rotten or fermented, just fizzy. What did I DO? lol. The first jars didn’t have that, and I’m not sure if the rest do or not. I have noticed some bubbles developing along the top of the syrup, but the jars seem to still be sealed tight. Sounds like you’re making apple hooch to me. If there are bubbles, there’s fermentation. The bubbles are CO2 – which is given off during fermentation. It’s not necessarily harmful. Given the high sugar content of the syrup, rather than spoiling, it will initially ferment into a mild hard cider/apple product. Left to continue to ferment, it would get more tart, like vinegar, as the sugar is consumed. It’s really hard to say exactly what happened long distance, but somehow fermentation is happening. A friend whose family does a to of canning said the apples might have begun fermenting before they were cooked. So I guess I’m brewing some hard cider now. I took the juice from the first jars that we had of each, combined them, and added the mother from a friend’s batch of citrus vinegar. I’m hoping to get a sort of spiced vinegar from it. I made some spiced crab apples, how long before II use them before they are marinated? I’d give them at least a week. Just tried making the crab-apple preserves for the first time… I have not had this treat since my grandmother passed away. Thank you for posting the recipe… These taste amazing. i love both recipes, can’t wait to try. was wondering if you know how long they keep for? Quality is best if used within on year. They will darken over time. I have kept them up to three years. They taste just fine, they just don’t look as pretty. How many do you have to make at once to have them last more than a year? LOL We ate the first jar before they finished cooling! I’ve done a few jars of mulled apples, now it’s time to try this. Many years ago made Crab apples with red hots , forgot how we made these, do you know ??? I don’t use red hots because of the artificial colors, but there are plenty of recipes on the internet. Missy at Graceful Little Honey Bee has one at http://www.gracefullittlehoneybee.com/red-hot-cinnamon-apples/. Evidence suggests, but does not prove, that Blue 1, Blue 2, Green 3, Red 40, and Yellow 6 cause cancer in animals. The three most widely used dyes — Red 40, Yellow 5, and Yellow 6 — are contaminated with known carcinogens. The granddaddy of them all, Red 3, is recognized by the Food and Drug Administration as a carcinogen. The law requires it to be illegal, but pressure from Ronald Reagan’s Secretary of Agriculture, John R. Block, scuttled the required ban. About 200,000 pounds annually of Red 3 go into foods including Betty Crocker’s Fruit Roll-Ups and ConAgra’s Kid Cuisine frozen meals. Do you think I could make crab applesauce with this honey cinnamon recipe by cooking them down a bit more and putting them through my applesauce mill (similar to the one you have in the photo)? I don’t think we’ll eat them whole but we do want applesauce and I have a large crab apple tree at my disposal. (As a side note, I’m not sure if they’re ripe yet though, how will I know? ) Thanks for these! They sound really tasty! If you want applesauce with honey and cinnamon, simply cook down the apples and run them through your food mill, and then sweeten with honey to taste and sprinkle on some cinnamon. No need to go through the full recipe. As for determining ripeness, I generally let color and taste be my guide. Watch for the fruit to reach what you think is full color, then start sampling to see if it tastes ripe. A small amount of green apple won’t make you sick, but the sourness will let you know that it’s not quite ready. Is there anywhere I can purchase candied crabapples in a jat from anyone. I am having a family reunion party and would love to put them out with my condiment dishes! I’ve never seen them for sale, only apple slices.